Five years into the development of the commercial drone industry, a picture is starting to emerge about the nature of the flight risks, the frailties of the systems and the ways in which the hazards can be avoided, at least to some degree. 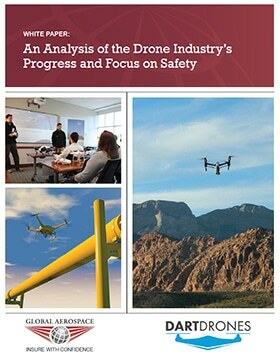 The Unmanned Aircraft Systems (UAS) industry is growing at a speed that will challenge our expectations. Global Aerospace continues to work with a significant number of companies to help them understand best practices and safely utilize this incredible technology. This new white paper, the fourth in a series, will analyze the data and share some of what we have learned from the substantial collection of salvaged hardware we have scrutinized over the past several years. DARTdrones, our SM4 Aviation Safety Program partner will also provide practical advice for loss prevention and risk management for drone operators. As a leading provider of aerospace insurance serving a worldwide portfolio of clients engaged in every aspect of the aviation and space industries, Global Aerospace has provided insurance and risk management support for unmanned aircraft operations since 2012. Our 90-year history of innovation and leadership in aerospace insurance gives the company the experienced insight into emerging, new technologies and associated risks. This form collects your name, company and email so that you can download the white paper. We will also add you to our contact list so that you can receive news from Global Aerospace. You can revoke permission to mail to your email address at any time using the SafeUnsubscribe link found at the bottom of every email.